My Los Angeles adventure continues, most notably the moment my interview with The New Year director Brett Haley experienced a catastrophic technical error in the 11th hour. Fortunately, Mr. Haley was kind enough to spend more time with me and the result was an engaging interview about independent film, performance, and the subtleties of great screenwriting. I’ll have that transcribed in the coming week. As for the festival, two interesting films couldn’t prepare me for my short-lived late night screening of The Wolf Knife, a competition film so ridiculously amateurish I had to walk out after only thirty minutes. And this coming from a critic who never walks out of films. Anyways, let’s try and forget that debacle and get to the movies that matter. The first half of this entertaining documentary on the “famous but not rich” music fusion group Fishbone is a dynamic history lesson on two decades of Los Angeles music culture. The filmmakers introduce the six key members of the original band through a great montage of 2-D animation, archival footage, and telling interviews. The group’s diverse personalties are juxtaposed with a shifting analysis on racism, musical genres, and the rigid corporate approach to selling art to mass audiences. 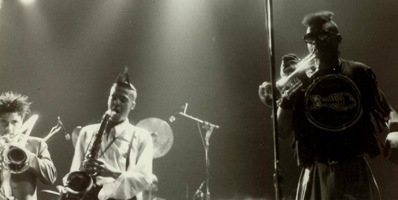 The film succeeds at showing how Fishbone and their kinetic live performances influenced so many bands (Red Hot Chili Peppers, No Doubt, Circle Jerks, Jane’s Addiction), ultimately revealing a number of stylistic and business factors explaining why the band never made it big despite being adored by its followers. Unfortunately, the second half of Everyday Sunshine pushes the narrative to a familiar rise and fall arc, where the band disintegrates due to ego, doubt, and the dreaded creative differences. The descent of Fishbone becomes far less interesting than their unique rise to legendary status. But each member of the band, most notably crazed genius frontman Angelo Moore and reserved bassist Norwood Fischer (the artistic forces still driving the band to this day), get a forum to tell their strange and layered story. Everyday Sunshine unveils a neglected overlap between the often violent and racist history of Los Angeles and the revolutionary music that provided the key voice for battling against mainstream conformity. Variety critic Robert Koehler presented Katalin Varga as a part of the FILMS THAT GOT AWAY sidebar, and it turned out to be an exemplary programming decision. The debut film from Brit Peter Strickland, Katalin Varga is a revenge film of great weight and depth, using it’s concise narrative to focus on the seeping menace undercutting every scene. The titular character (played by Hilda Pater) sets off in a cart with her 10 year old son Orban (Nobert Tanko) after a destructive secret comes to light banishing them from their village. Once on the sparse roads of Romania, Katalin’s mission of vengeance becomes incredibly focused, and Strickland slowly unveils her intentions with keen attention to detail. Shot on location in the hauntingly majestic Carpathian Mountains, Katalin Varga uses a rhythm of audio tones to foreshadow both the trauma’s of the past the inevitable violence to come. This eerie score of contrasting sounds merge with the Strickland’s use of long lenses to film the epic countryside. The result is a film obsessed with both mood and character ambiguity, revenge and counter-revenge. At just 82 minutes long, Katalin Varga manages to discover a woman’s broken soul on the verge of redemption, and the epic conflict of conscious residing just beneath each character’s deceptive facade. Stirring in every respect, Katalin Varga charts the rocky terrain of emotional sacrifice and physical violence, showing in tragic detail how they inevitably overlap. – Two more days to go, then back to reality. Three more films tomorrow, including Claire Denis’ White Material, so stay tuned.